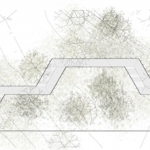 非常感谢 Studio Puisto Architects 予gooood分享以下内容。更多关于：Studio Puisto Architects on gooood. 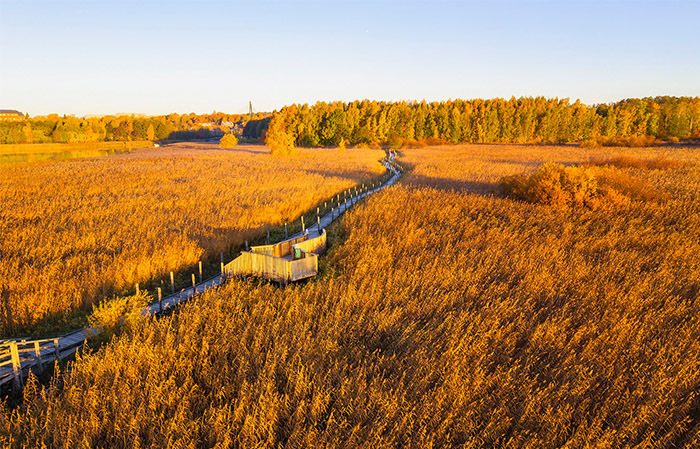 The Nattours project began with the goal of making the local natural attractions in Helsinki, Finland more accessible, not only from a practical standpoint, but a humanistic one too. 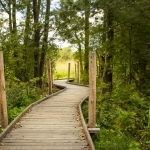 The result was a series of accessible nature trail boardwalks throughout several islands in the city. 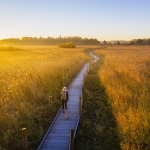 Despite the rich biodiversity and scenic wilderness in the area, the pre-existing trail structures were not able to support and drive enough interest into their use and these new trails sought to change that. 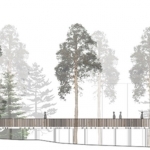 As a joint effort between the cities of Helsinki and Tallinn, the Nattours project involved Studio Puisto, in collaboration with Nomaji Oy, to design the new accessible nature trail boardwalks initially for Lammassaari island with later phases in Vanhankaupunginlahti and Harakka island, all of which are located in Helsinki. For the island of Lammassaari, the preexisting duckboards and path structures leading into the island were redone with a modular design that consists of four different components. 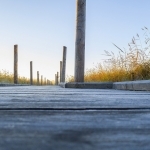 This construction method allowed for the preexisting base structures and soft bends to be sustainably reused along the approximately one-kilometer long boardwalk route without waste. At the same time, two new birdwatching platforms were built along the path with an additional platform next to the current bird observation tower on the island. 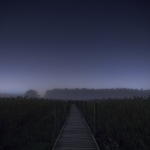 On the other hand, for the island of Harrakka, the focus was instead on developing new ways to coherently mark the nature trails as well as designing uniform railing systems for them. 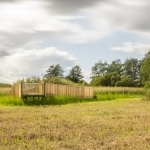 A preexisting concrete bunker in the area was also transformed into a birdwatching tower, with the wooden structures making up the trail leaning on and twisting around the bunker to create a sheltered observation place. 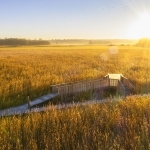 One of the most fundamental aspects to the Nattours project was that the entire boardwalk needed to be thoughtfully designed for everyone to equally enjoy, meaning that it was essential for it to be adequately accessible. To best prioritize accessibility, the path follows gently sloping curves along the way while the ends of the observation platforms are fully glazed to allow both children and wheelchair users alike the possibility look out into the vast nature without obstruction. 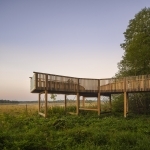 In addition, the ends of these observation platforms are also organically enlarged to support teaching purposes as well as to facilitate a more social, comfortable birdwatching experience. These sorts of details, although subtle in practice, help make the paths more accessible for all without taking away from the overall design aesthetic. 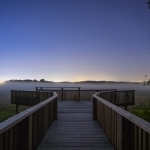 Given the site’s propensity to periodically flood, the Nattours boardwalk supports this natural occurrence rather than interferes with it. In its modular construction, the structure has a sequence of vertical wooden poles along its edges where the path is attached to on the sides as opposed to anchoring the path entirely into the ground. 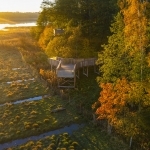 Thus, when the island of Lammassaari floods, the top substructure layer of the boardwalk not only floats upwards with the water, but also remains in place due to the placement of these wooden poles. 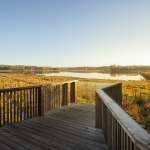 By allowing all natural events, even those conventionally seen as negative, to have an influence and effect on the architecture, it fully embraces the nature around it – a solution we feel is fitting for a nature trail. Altogether, the design approach for Nattours is one that we hope will better foster an engagement with the nature around us in the generations to come. More: Studio Puisto Architects 更多关于：Studio Puisto Architects on gooood.